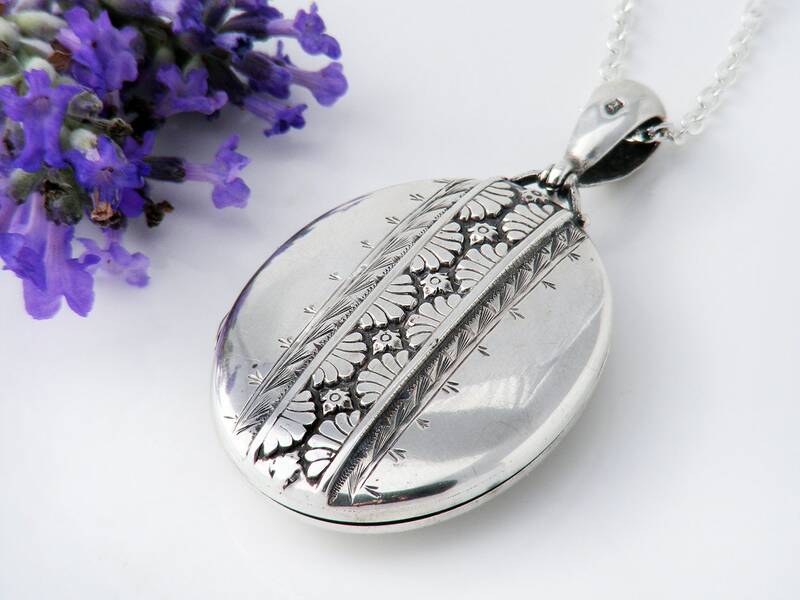 A sterling silver antique locket from the Victorian era, well textured with central raised repoussé design and intricately hand chased borders - a truly beautiful locket. 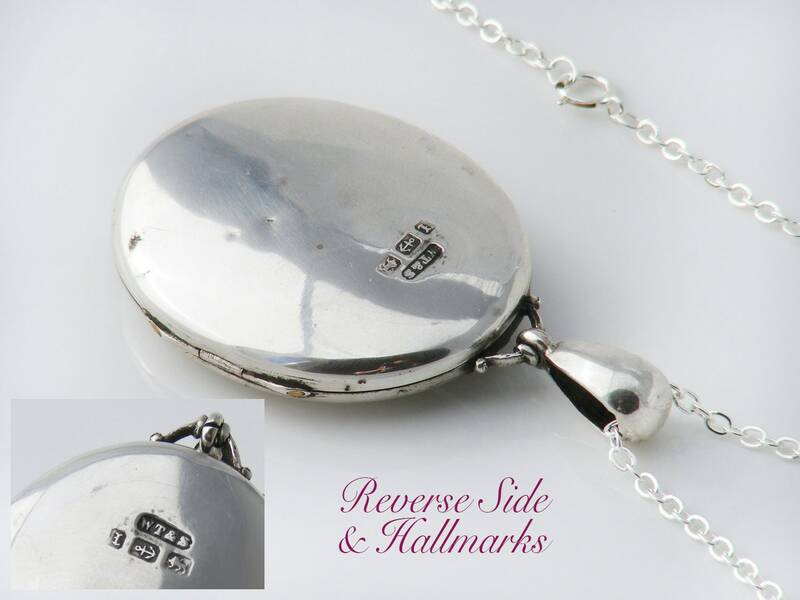 Polished sterling silver, with a plain smooth back stamped with an English hallmark for Birmingham, England and the year 1885 together with the maker's stamp 'WT&S'. The bail is also punched for sterling. 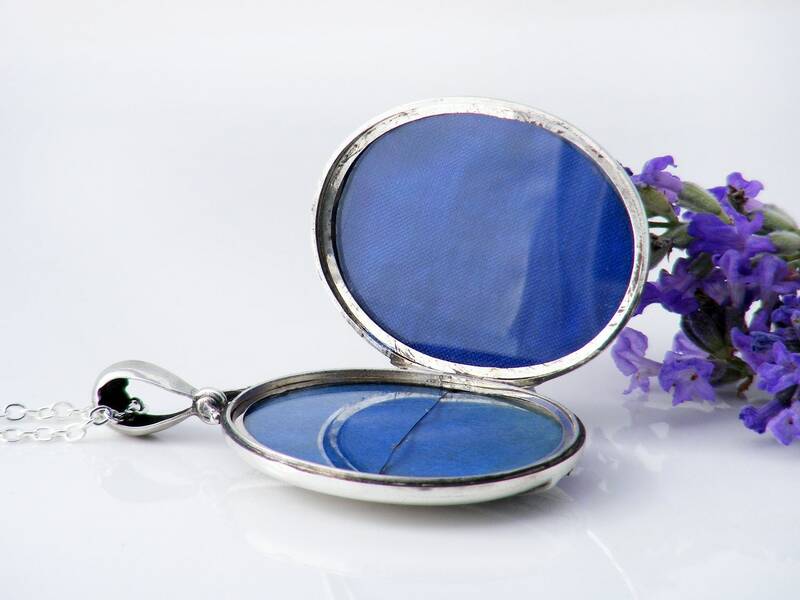 The locket has all of the original contents: two photo retaining rims, blue silk lining fabric and glass covers (one of these is broken, see note under Condition). 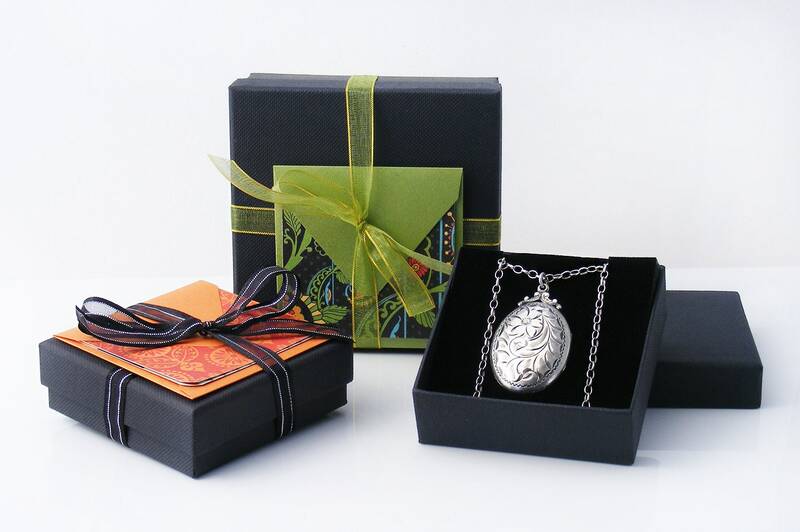 The ornate articulated bail ensures that the locket always 'sits' well. A larger size, measuring 1.18 x 1.57 inches (30 x 40mm) gently rounding out to approximately 9mm thickness. The drop from the chain including the bail is 2.25 inches or 58mm. Age: 1885 - 134 years of age. Presented on a new 30 inch or 76cm sterling silver chain, stamped 925 to the clasp. Photograph #5 shows the locket and chain on a life size torso. Condition: Very, very good. Two tiny dimples and a small black spot to the back, barely there - there are no holes or breaks in the repoussé work. The hinge is strong, there is a nice firm pop as the shuts tightly. Note that one of the internal glass covers is broken and the silk on that side very faded; left in place for authenticity but easily replaced. 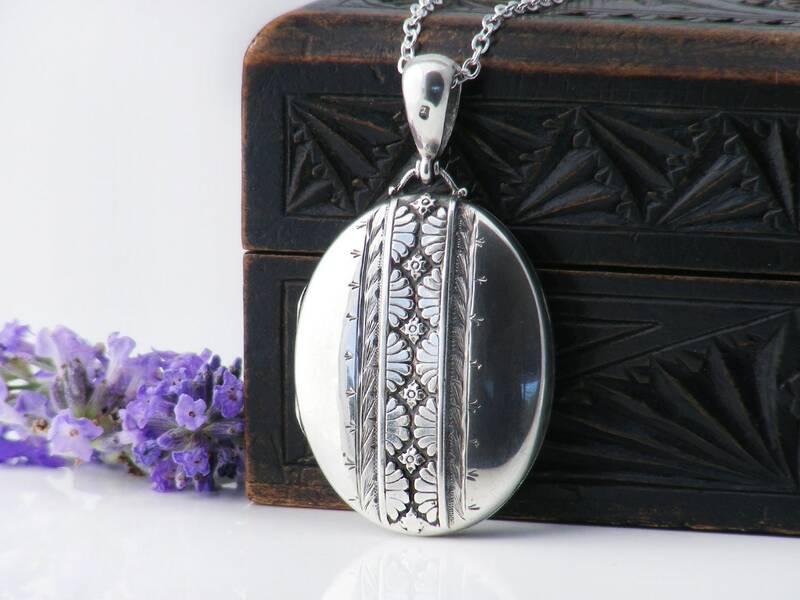 A well made and very strong locket with many decades of wear yet to come! 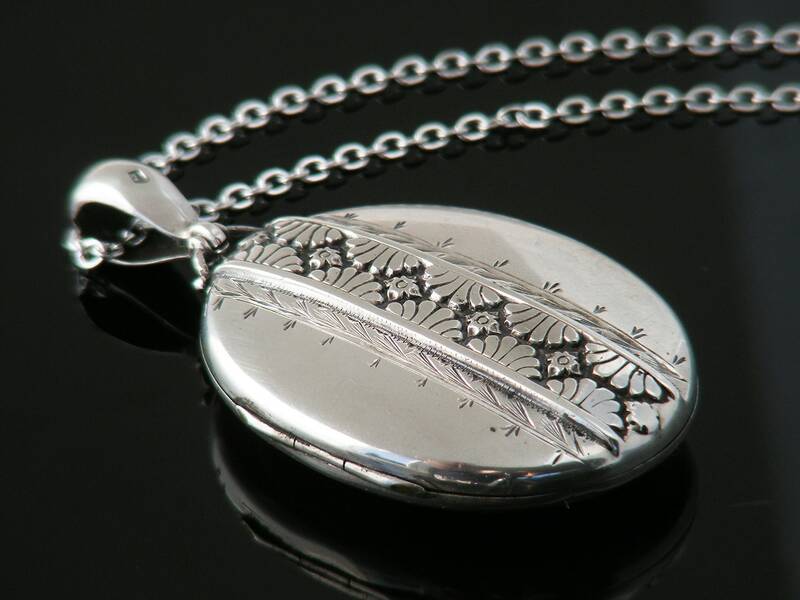 The embellishment to this locket is beautifully executed with contrasting textures that are very tactile. A Victorian beauty.